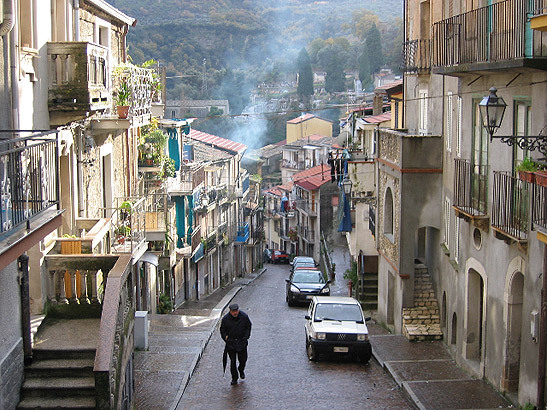 eggio Calabria, Italy - One of the most neglected destinations in Italy is the lower boot. But things are changing as tourists discover the remarkable beauty of the rugged hill towns, Mediterranean influenced cuisine and travel bargains the south affords. Greek influences are felt here and a dialect of the language is still spoken in some areas. Southern coast of the boot and sight of Scylla and Charybdis in the Strait of Messina separating Italy from Sicily. In summer the little lanes that run through the towns and the beautiful beaches on the Adriatic and Ionian Seas get a lot of European tourists and recently Americans have been discovering their charms. With more and more restaurants in America featuring the tasty foods of Puglia (on the heel and pronounced "poolea"), the instep of Basilicata and toe of Calabria, gastronomic tourism is becoming more important as well. Cuisine changes with the land in this area, depending on what the earth provides and tradition demands. The stigma thrust on the South by the wealthier North as a land of peasants, has preserved the area and its agricultural economy and the new rush of tourism is bringing money and new self-esteem to its inhabitants. Many Americans trace their family roots to this part of Italy; where over the last 160 years poverty and internecine warfare forced Italians to leave the "Old Country," fleeing to America. My plane descended into Southern Italy on a wet January day, landing in the Adriatic port city of Bari, which lies on the Achilles tendon of the boot in northern Puglia. Southern Italy is not particularly warm in winter if you're a spoiled Southern Californian. But the temperatures are moderate, reaching into the mid 50s, and you get as many rainy days as sunny. We even saw a little snow. In summer temperatures can soar well above 100 degrees. Puglia is an abundant agricultural area, flat and lush, producing the hard durum wheat that makes the best bread in the country. The tomatoes are sweet and tangy and when sun dried spectacular. Citrus is abundant in all forms and often served at the end of meals. Forty percent of Italy's olive oil comes from the region and the primitivo grape makes the best red wine. I also liked several of the whites, especially the Librandi from Calabria. Other excellent southern wineries are Cantina di Venosa and Il Conte di Melissa. Cantina Sociale in Venosa has a tasting room. Wine has been made in Italy for more then 4,000 years. The Ancient Greeks arriving in Southern Italy named the countryside Enotria - land of the vine. Matera is the home of Amaro Lucano, my favorite new discovery. 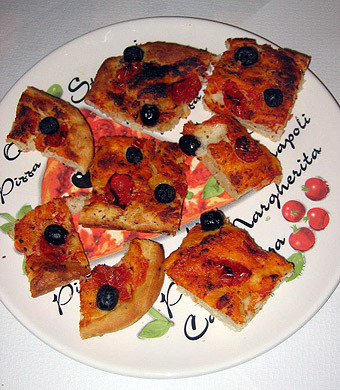 The name means bitter and it is usually served as an after dinner digestivo. 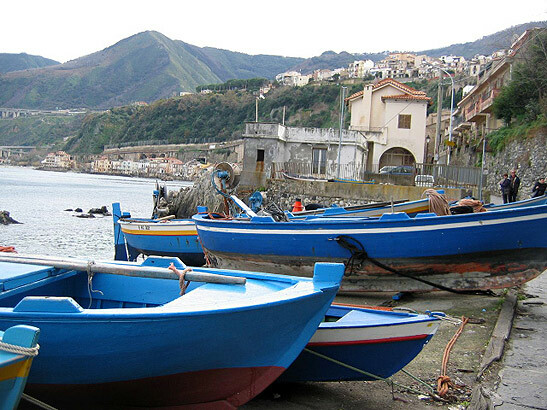 Because of the area's long seacoast there are many picturesque fishing villages and great fresh seafood. The southerners are also fond of hot peppers and they can surprise an unwary diner. The Spanish introduced potatoes to the area and one of the best dishes I had was potatoes roasted over an open wood fire until soft and smoky, then sprinkled with a mixture of salt and rosemary and drizzled with olive oil. Simple but sublime. This is primarily a cuisine of poverty and you won't find a lot of beef, cream based dishes or eggs in the pasta, but the simple combinations of scavenged greens, seasoned breadcrumbs, fruits, and vegetables of the season, all sorts of seafood, lamb, rabbit, chicken, pork sausages and occasionally wild game, creating a delicious and healthy cuisine. Orecchiette (little ears) pasta has its origin here. One of my favorite meal endings was orange segments and thinly sliced fennel dressed with olive oil, a touch of vinegar and lightly salted. I hop scotched between Puglia and neighboring Basilicata, before heading to Calabria, with its breathtaking coastal vistas and its romantic Strait of Messina, which separates the boot from the soccer ball of Sicily, the island kicked off the toe into the Mediterranean. 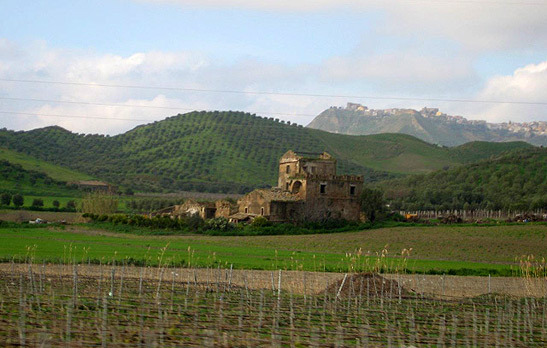 Basilicata is a rugged land full of stony fields and rocky terrain. 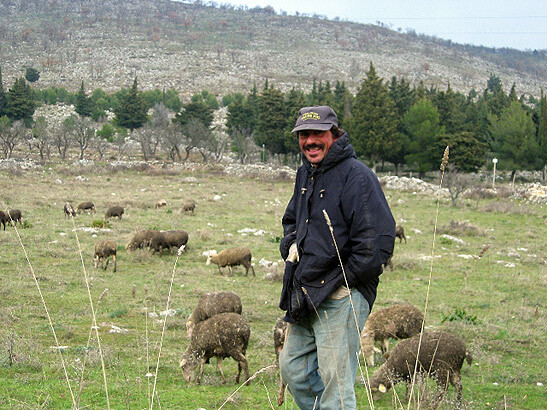 As a result there's a lot of herding including goats, sheep and cattle, which thrive on the herbal grasses that grow among the sedimentary rock and gives the cheeses and meat a special flavor. The south's most famous cow's milk cheese, caciocavallo, which rivals Parmesan as the king of Italian cheeses, is produced in these aromatic fields. The lactic heaven of oozing buffalo mozzarella comes from the damp, soft grassy fields around Foggia, which the water buffalos prefer. 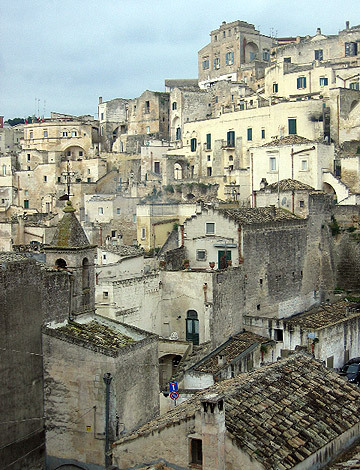 The old town of Matera is a UNESCO World Heritage Site. Carved out of sedimentary rock, it is quite beautiful. In this town, one man's floor is another's roof, with houses cascading down narrow serpentine streets and walkways. Not a good place to be a postman or furniture mover. Stone town of Matera featured in Mel Gibson's "The Passion of the Christ"
Matera is one of the oldest inhabited human settlements in the world. Mel Gibson set "The Passion of the Christ" here because of the terrain's similarity to Mount Golgotha. From the first century, early Christians practiced Mass in the caves of the surrounding hills and escaped persecution from Romans and others who worshiped pagan gods and Orthodox Old Testament religions. Because of the areas deep and long spiritual history there is a great deal of religious tourism in the south, especially with the Canonization of Padre Pio a few years ago. The formally agrarian town of San Giovanni Rotondo, site of the hospital where Padre Pio recorded 490 miracles, recently completed construction of a 5,000-seat cathedral. More than seven million pilgrims now visit the town every year and the farmland has been converted into new hotels, restaurants and shops, and street venders sell everything from giant statues of the Virgin Mary to holy water; and the biggest seller, items featuring Saint Pio. Unfortunately as you ride through the rich farmlands of Southern Italy, deserted and crumbling lovely old stone buildings and estates loom, haunting the fields like the skeletal bones of animals. Lying on the tip of the toe, Calabria offers dramatic landscapes as you cross from the Ionian Sea on the south over the high Apennine ridge, where we encountered snow, and descend to the Tyrrhenian Sea side and view the steep coastline that shelters little fishing villages, especially the charming Borgo Marinaro and Costa Viola. The seaside resort town of Crotone gets the fame or blame for the invention of fruitcake. The city of Reggio Calabria is the largest in the area and has a lovely promenade facing the Strait of Messina that many consider the most beautiful in Italy. 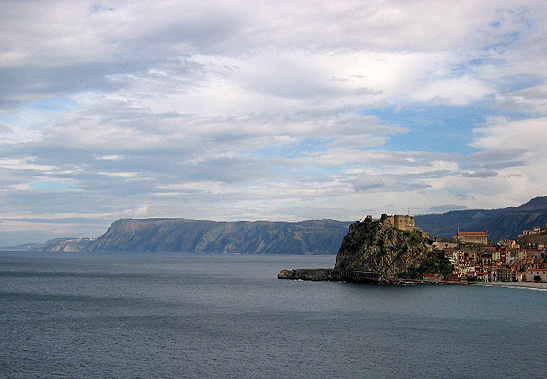 Just two and a half miles across the Strait is the island of Sicily. The town has been talking about building a bridge to the island for 40 years, and it looks like it may finally be happening as architectural plans are being submitted. In the stone city of Matera, the modern hotel Locanda di San Martino is carved out of the rock and features an underground pool. A rustic local restaurant, Le Botteghe, cooks food over an open wood-burning pit. Try the potatoes and lamb here and the pasta at nearby Rivelli. In Foggia, stay at Palazzo Sant'elena or Hotel Rossemi, which serves excellent seafood. Agriturismo Carpe Diem in Venosa is a working farm with eight guest rooms, great breakfasts and food from the farm. La Casa di Gianna is a friendly restaurant serving local cuisine and in Potenza the Tourist Hotel serves regional cuisine. In the city of Crotone in Calabria, dine at Ristorante Il Conte di Melissa, Don Pedro or La Taverna del Borgo. The best hotels are Palazzo Foti, Baia degli Dei and Lido degli Scogli. In Reggio Calabria, Stay at the Montesano Hotel, either downtown overlooking the promenade or outside of town on a magnificent property facing Sicily and the Strait of Messina. On the last day of my visit I enjoyed the best pizza in the region at Pepy's in Reggio Calabria, a proper end to my culinary tour. 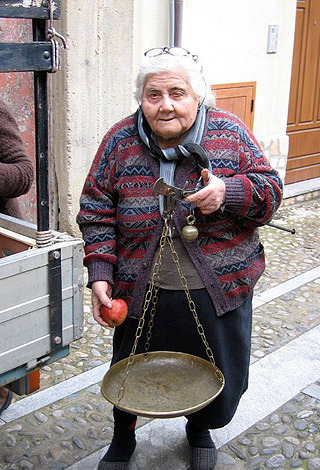 If you want to get a boot out of kicking around Southern Italy, the Italian Tourist Office, publishes a number of free pamphlets and maps, information on special events, festivals, museums, churches and castles, religious tourism, guided and self-guided tours, and places to stay and dine in all price ranges. Let John know what you think about his traveling adventure. Hello John  I enjoyed reading your article. I live in La Bufadora and have friends visiting next week, so you have given me some good tips on where to go in our wine country. We have always called Cetto  L.A. (like Los Angeles) Chet-o and it might have been worth mentioning that it is actually Italian in origin. Also, I don't know about when visiting the Valle, but when in town, it is better to have pesos than dollars. Right now the rate is approx. 11.70 for each dollar. Just sayin' and like I said good article! Hi, We here at Country Living Magazine are working on a story about hotels around the US. We would like to feature the Paso Robles Inn. I have to find photos to go along with the story. I was wondering if you could please send me any images of the hotel. This can be anything from the rooms to the food! All images can be submitted low res and if selected I will ask for hi rez later. Also, if you know of any photographers that have photographed the hotel can you please give me the contact info? Thank you so much! I am looking forward to my "silver" years, which in my case, will be the years (if fate is good to me) that I will finally be traveling. New Zealand is at the top of the list - I have always been drawn to it. Yes, was a fun city. Bad wine though.